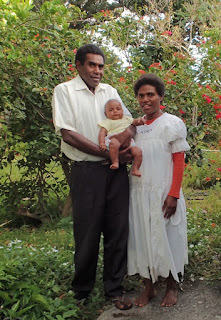 On Tanna, everywhere there was a body of water, seemed one or more women were doing laundry. “You’re going to the volcano? He lives very close to the volcano. You should stay with him and his family,” Malachite suggested. Isaac, whose home he was volunteering, nodded in acquiescence. Isaac holding Isiah, Rosalie, Isaac’s second youngest son, and only daughter. We were all aboard the freighter ship m/v Lawilin, which was soon bound for Tanna, home of Vanuatu’s most famous live volcano, Mt. Yasur. Malachite, as it happened, was just temporarily hanging with his fellow clergy friends aboard; he was officiating a football game in Port Vila, then flying back to Tanna. Like his friend, Isaac Loughman, he was part of a contingency of pastors returning home to Tanna from a series of island-to-island church meetings. In fact, my stowed backpack was stuffed with my camping gear… tent, drop cloth, sleeping bag, air mattress and some simple foods for easy camp prep. I’d made reservations to camp at Yasur View Bungalows, but all along figured that as I wasn’t taking up bungalow space, and if I got a better offer, it wouldn’t be a big deal to break the reservation. by his young cousin. White Sands, Tanna, Vanuatu. Given after Malachite left, the hospitality offer was repeated by Isaac several times, I decided to take him up on his offer. While the volcano was my reason for the visit, our normally boat-bound habits discouraged getting a better, more personal sense of Ni-Van village life. I was curious. It wasn’t clear whether I’d still be camping in Isaac’s yard (my preference) or staying inside, though I suspected the latter. “I’ll arrange a ride for us to my place, and go with you to the volcano tonight,” Isaac offered. Mark Silverstein of Field Trip far preferred the Ambrym Mt. Marum volcano hike (click here to see their family’s awesome video of Mt. Marum’s volcano, it’s seething magma viewed fromMark’s drone), calling Tanna’s volcano experience “too Disneyland.” I figured staying at a local’s place and seeing the volcano with him, rather than going there with a pre-arranged group of tourists would help offset that potential sense of artificiality. Besides, I loved playing tour guide to places I called home for visitors, and figured Isaac might feel the same way. Admittedly, I did have a few reservations…. Panorama Lenakel’s shore. Looks more inviting than it is; it’s coral, not sand. Tanna. Vanuatu. he left. Rosalie was happy to encourage him. Not only was I not Ni-Van nor conversant in Bislama (Vanuatu’s official language, a version of Pidgin English), I am Jewish and childless. Isaac was a Presbyterian Pastor, father of four boys and one girl. In our chats on the long boat ride to Tanna, he did learn about my religious and family status, and had but did not take the opportunity to rescind his offer. His English was decent. 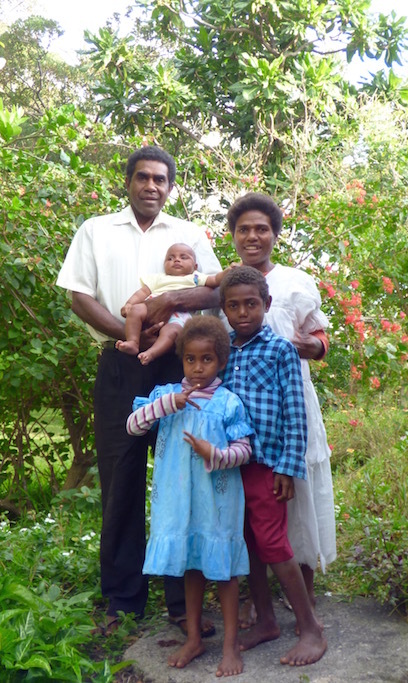 I was hoping his family’s might be as well, though the further you get from Port Vila, the more Bislama predominates over English*. *Turns out, in Tanna, French predominated as much or more than English as the second language of choice among those I talked to. This was especially the case if they were in their teens or early twenties, where they took French in school. What I did not expect, after our 20 hour boat ride, preceded by a 4+ hour wait for the boat to leave Port Vila, was an additional two hours waiting for Isaac to gather his stuff from the boat*, co-ordinate a ride and go. While waiting, I shared my cheese with a father and his son, under a shade tree. They gave me two of their big fat juicy tomatoes; it struck me I got the better part of the bargain and hoped they felt as satisfied with the cheese as I was with the tomato. Two young giggly teen girls played with my hair, teased and flirted with the local boys. When I offered my remaining bread, they helped themselves to the whole loaf. I figured if they took that much, they needed it more than I did. 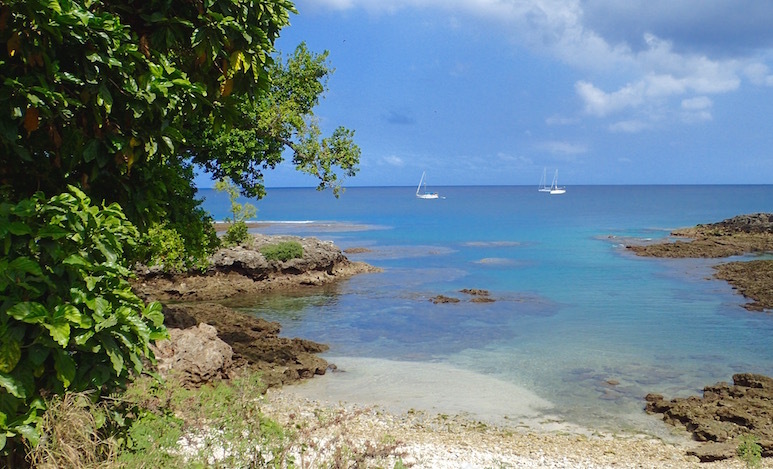 For Tanna’s “port town,” Lenakel’s water, like Port Vila’s was amazingly clear. Vanuatu. 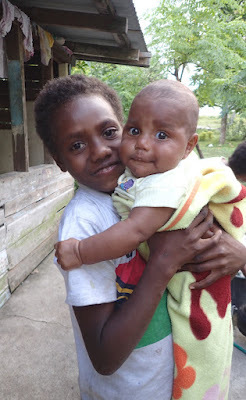 Nor did I expect the ride to take over two hours due primarily to Isaac’s shopping stops – for a 25 pound bag of Australian rice, for bread, and for a variety of produce -- on the way from Tanna’s Lenkel to his family home in White Sands. While Isaac arranged volcano transportation and settled back into home, his beautiful wife, Rosalie, chatted me up and gave me the tour. Along the way, the decision was made to bring his nuclear family along (Isaac, his wife, their 3-month old son, their next youngest son and their only daughter, one other son was staying elsewhere in the village and Isaac’s oldest was in boarding school in Lenakel) as well as a few other villagers and relatives. At this point, I confess, given the long waits already and growing contingency, I wondered if we’d make it to the volcano by dark! It was obvious by the ride in, “close to the volcano” was far from walk-able to it, especially before dark. Well, when with a pastor, I figured the right attitude was to have faith it would all work out. Rosalie explained she the headed the local women’s group, and in addition to that and parenting, her responsibilities included managing their crops, cooking (Ni-Van food is fairly labor-intensive), sewing (she made many of the family’s clothes, though now by hand as her sewing machine died), and maintaining the home. “Very busy,” Rosalie said, more than once. It sounded like her mantra. forming a “v.” Banyan tree in background; Tanna, Vanuatu. Rosalie mentioned Isaac was returning after nearly a month’s absence. A bit embarrassed to be there his first night back after all that time, I expressed my regret his return was saddled with (as I described myself) “some strange woman Isaac met on the ferry.” Rosalie smiled politely but graciously, as I wondered how she felt about the novelty of my visit, and its likely far less than desirable timing. The pastor’s home was built by New Zealand missionaries over 100 years prior. Rosalie pointed out their gravestones, in between their yard and the church. There was an abandoned cistern, replaced by two large plastic catchment tanks collecting rainwater off the church roofline. Their congregation supported 80 families, and school, providing kindergarten through middle school education. Heading inside, I stepped carefully across their porch, where some of the floorboards were rotted away. On the way, I passed two soak tubs of fresh-smelling laundry. Overall the house appeared to hold up reasonable well given its age, though I noticed one dinner-plate sized interior wall hole. The home consisted of a large covered porch entry, a main room, an alcove I didn’t see and assume served in some kitchen capacity, and two rooms off the back of the main room. One of the rooms was Isaac and Rosalie’s; they insisted on sleeping in the main room while I stayed in their room, on a pad, freshly made up with sheets and a pillow. The main room included a large table acting as a short-term pantry (for Isaac’s “grocery run”) and a place for some large pots, a bench, two white plastic lawn chairs, a long sleeping pad in the middle of the room and another table for educational material (children’s school work and church teachings) and household projects. A sewing machine was tucked into a corner atop a small desk near the kitchen alcove. 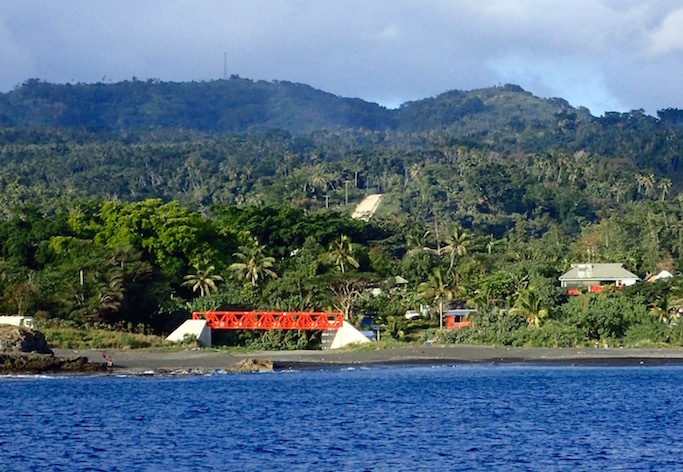 The Chinese created this attractive Lenakel, Tanna bridge in exchange for Vanuatu fishing rights. The road to the bridge has yet to be completed. The window frames had slats and simple curtains, but no screens or windows; the air flowed freely through the home. Ceiling light fixtures showed snipped wires of disuse; the Loughman’s confirmed there used to be electricity, used by prior residents. For night light, the Loughman family relied on a small solar light, ubiquitous throughout Ni-Van and some remote Fiji villages. “We used to have two,” Rosalie explained, “but we gave one to our son to have [in boarding school].” I was glad I brought my flashlight, though gave up on doing much that required reasonable light until morning. Washing was done over a bucket outside. There was no running water. Fortunately, hygiene appeared to be a far stronger priority in the Loughman household than for many Ni-Vans, among whom the strong scent of perspiration was common. About 100 yards from the house, there was an outhouse, with an open cement rectangle to squat over and a black plastic tarp for privacy. There was no toilet paper. Sigh… between the “bucket-and-chuck-it ‘express’ boat” from Port Vila to Tanna out and the long wait to get to the Loughman’s, I’d hoped for more. Miraculously, we did make it to Mt. Yasur, family in tow, just as the sun set. 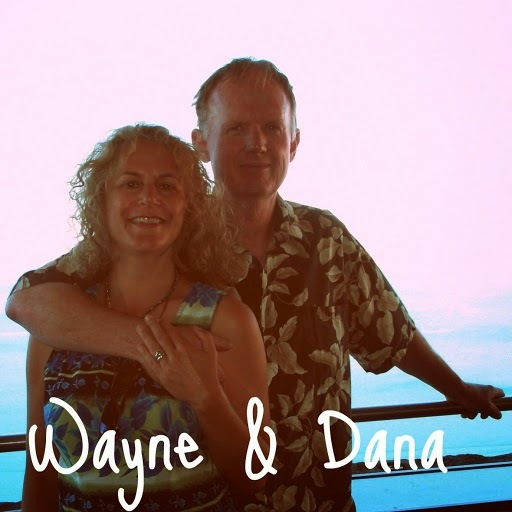 It was their first time there and they were not charged the $75 entry fee. Yet only Isaac joined me at Mt. Yassur’s ridge, the rest of his family decided to remain in the parking lot. More on Mt. Yasur volcano in a future post. After we got back from the volcano, we supped on fat slices of buttered bread (and peanut butter and jelly, my contribution), and tea (Earl Grey, my contribution) with water heated over a propane cooker. To our delight, the meal was supplemented with laplap, cooked that day and dropped off by an aunt. Ni-Vans appreciate visitors who enjoy their native foods, and I find the smoky-gummy flavor of laplap to be a satisfying “comfort food.” It’s quite filling. “Cassava, [the most common starch used in laplap]*” intoned Rosalie with great seriousness, “is a very important part of our diet.” Not the first time I’d heard or observed that! *At a yachtie dinner at Lol Tong’s Yacht Club, on Pentacost, we also ate laplap made with yam (Wayne’s “favorite”), and laplap made with taro root. “I am not exactly bowled over by Ni-Van cuisine,” Wayne confessed, privately. 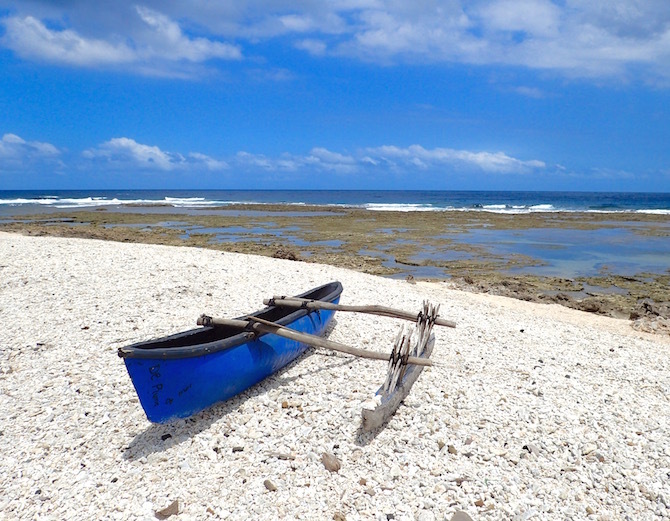 Classic Vanuatu outrigger canoe, near White’s Beach, Tanna. Over tea, we discussed each other’s lives. When I asked Rosalie how she and Isaac met, she recounted his seminary career…. School in Port Vila followed by parish work at several islands before ending up back “home” on Tanna. Like most Ni-Vans, the Loughmans were surprised I had no “pickaninies*” (children), that I and my parents went through a divorce, though I explained nearly half of the marriages in the USA end in divorce. They were amazed at my parent’s age – Dad at 92 and Mom at 88; older than most Ni-Vans live to. 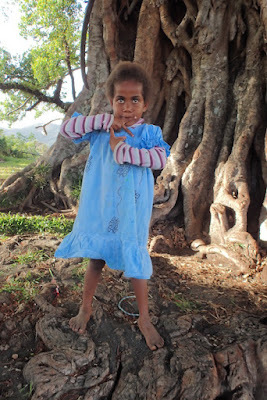 *Any time I used a Bislama word, like pikanini, or showed any knowledge or understanding of the the Ni-Van culture, I was rewarded with a warm smile. This was not unique to the Loughmans. They appreciated the little I’d learned, whilst I was embarrassed at how little I’d learned, wishing aloud that it was possible spend more time in Vanuatu, getting to know the country and meet more Ni-Vans. We planned the next morning for my departure after breakfast and taking a family portrait, per Rosalie’s request. The Loughmans provided their mailing address for the portrait, as they had no email or even, unlike most Ni-Vans we encountered, mobile phone. 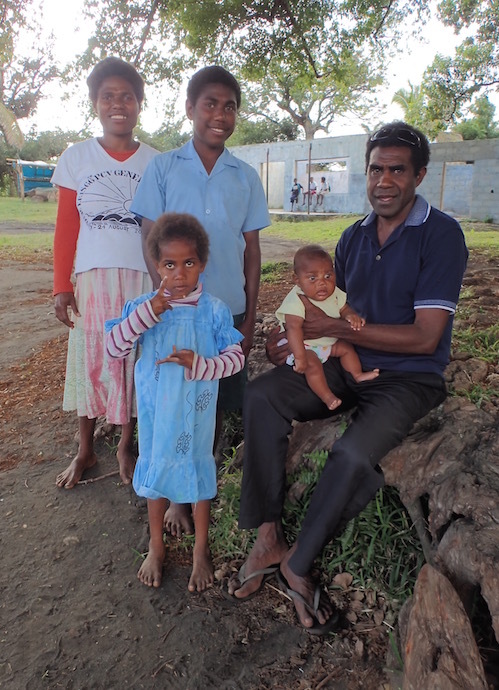 I promised to print and mail them their family photo before leaving Vanuatu. his way to school. 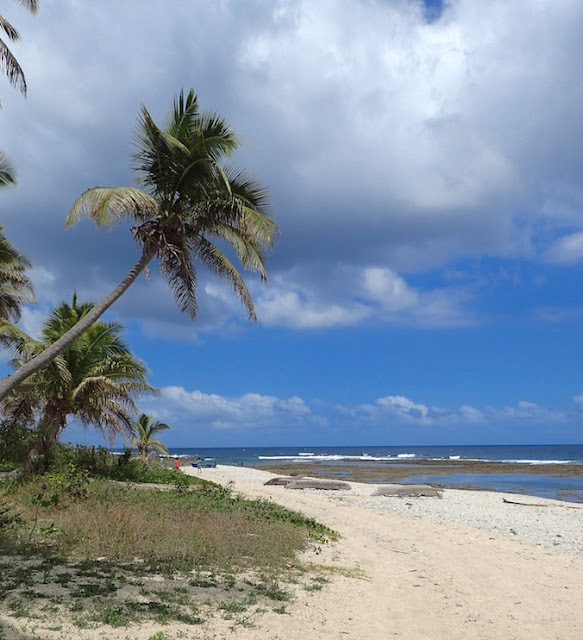 White Sands, Tanna, Vanuatu. There were hugs all around, and all too soon it was time to leave. I felt touched and humbled by the Loughman’s warmth, acceptance and generosity, and hoped they got as much out of the experience as I did. It was a good lesson in how happy and healthy and relatively self sufficient a family can be without any of the modern conveniences… such electricity, running water, flush toilets, phones, wifi, or appliances like washing machines. Despite leaving them with a boat card, given my lack of permanent address and their lack of email, I doubt I will hear from them again. But you never know. This time, the trip back to Lenakel, in an extended cab truck, took less than an hour! That despite the driver’s several stops to point out to some of the locals his strange passenger. At least, given his body language and the disapproving reaction of the professional-looking gal in the front passenger seat, struck me as the reason for the stops. Once again, I found myself with many hours to kill before leaving, yet too cautious to travel very far afield from my ride back, on m/v Lawilin. I chatted with others awaiting Lawilin’s departure. Left my bags with one of the shopkeepers so I could wanted around unencumbered. Accompanied a young French guy to the hospital; he was there working on sanitation projects via Australian Aid, and getting a swollen infection taken care of. Watched women doing their washing by hand in the ocean, laying the clothes out to dry over the dead coral shoreline. Wandered the seashore, where a nice family introduced me to their two young sons who relished saying “Hello!” and “Bye-Bye!” in English. Ate a fantastic curried chicken and rice lunch for $3.50, meeting the folks from two other cruising boats I’d seen bobbing in Lenakel’s rolly harbor. 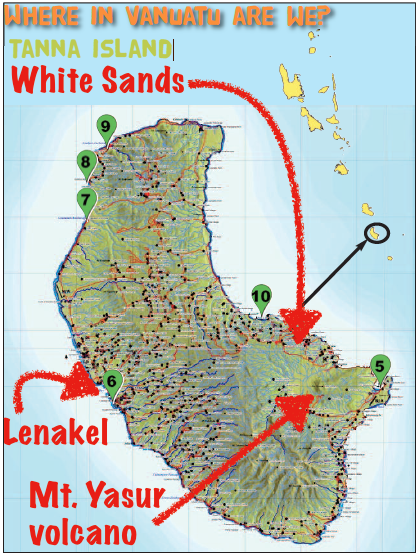 Lenakel, Tanna, where I unitentionally overshot the entrance to White's Beach. Unused to rides from anyone other than paid bus or taxi drivers in Vanuatu, it took me a while to realize the truck driver who stopped to offer me a ride back to the docks was simply being nice. After so many weeks stuck in cruise-shippy Efate, and confined mostly to anchorages by inclement weather, this was the Vanuatu I’d hoped to see. Yes, I came to Tanna for the volcano, but left as much or more with a great sense of warmth for the people of Vanuatu, just being themselves. White Sands is the closest town to Mt. Yasur, but it’s still a ways from the volcano. The black arrow shows Tanna’s place within the Vanuatu Island chain. While I went to Tanna Sunday, September 13, returning Wednesday the16, 2016. 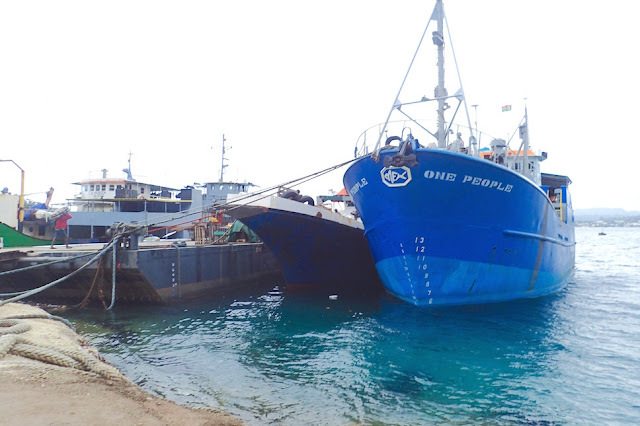 Wayne and Journey remained at Yachting World mooring S17.44.750 E168.18.729) in Vanuatu’s Port Vila. This post was written while anchored off New Caledonia's Port Moselle Marina (S22.16.695 E166.25.688). We arrived in Noumea, New Caledonia September 21, 2016, a 300+ mile trip from Vanuatu. 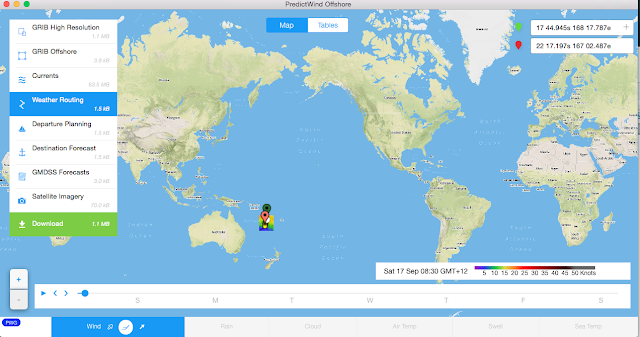 Our Predict Wind map from Vanuatu to New Caledonia, zoomed out to give a you a sense for where in the world we are now.